I love eating, cooking, crafting, zumbaing, ice skating, and lots of other randomness. Since December 2008, I've lost 15 lbs and I hope to continue my healthy habits of nutritious eating + frequent, fun exercising. This is a Flickr badge showing public photos from thechiclife. Make your own badge here. Whether you're a new visitor or a frequent reader, I appreciate you spending some time with me here in my little space on the blogosphere. I love seeing your comments and emails pop-up on my computer, and even if I can't reply to your comment, I want you to know that I appreciate you taking the time to leave me a little note. How kind of you?! Thanks so much for stopping by my little blog! All images are copyright by me, unless otherwise stated. Please do not use my content, photos and/or text, without permission. Thanks for your understanding! Shop D Celestine (that's me!) and I'll handmake you some jewelry! *** NOTE: For updating Google Reader, I've heard you have to delete the subscription to my Typepad blog and then add the new one. Maybe try that? A couple of days ago, one of my all-time favorite Everyday Italian shows came on - Breakfast. The one where she makes the Hazelnut Cinnamon Rolls, Mini Egg Frittatas, and Spiked Coffee drinks. I knew immediately that I wanted to make that meal on my vacay. I love from-scratch baked goods but don't typically allow myself the time to make such treats decided, but what better way to kick off 2010 than with a delicious brunch! Hubby and I searched TWO grocery stores for frozen white bread dough, but found none. I figured any white-bread style dough would do, so we picked up a box of Pillsbury Hot Roll mix. First thing this morning, I got started on brunch. I knew it would take awhile to make what with the "let the bread rise" steps, so there wasn't time to lounge around. I used a combination of the box recipe and Giada's Hazelnut Cinnamon Rolls recipe. For the Cinnamon Rolls: Follow box directions for cinnamon rolls. To sugar mixture, add toasted, chopped hazelnuts (about 1/3 cup - 2/3 cup) and 1/4 tsp cloves. Instead of using warm margarine, I used melted Earth Balance, which I brushed over the dough before sprinkling the sugar mixture down. I also made a double-batch of Giada's icing instead of the one on the box. I wanted to have one cup of coffee and wanted that cup to be enjoyed with breakfast, so I sipped on organic yerba mate tea whilst working on the cinnamon rolls. Hazelnuts! I had these stowed away in the freezer. I cut the dough and placed the rolls in the baking dish. They rose for 30 minutes while I watched a DVRed Everyday Italian for more Eat in Month inspiration. Soon enough, they were ready to be baked! For the Mini Frittatas: While the cinnamon rolls baked, I got the mini egg frittatas ready. I used Giada's Mini Frittatas recipe except I cut the recipe in half and used turkey instead of ham. parsley from my potted plant. The eggs were a cinch - especially compared to those cinnamon rolls. I used turkey since we had it in the fridge. While my frittatas cooked, I worked on the icing for the cinnamon rolls. I used Giada's recipe but doubled the batch of icing since the rolls made twice as many as Giada's version. Before I knew it, the frittatas were done! I drizzled the rolls with the icing and put the rolls in the off, but still warm oven to help the icing get nice and gooey. And then, everything was ready! Hubby and I were so excited to EAT! Round #1 - I had 3 mini frittatas and a cinnamon roll with my coffee. As a side bonus, I read somewhere that some cultures consider it good luck to eat "round things" on New Year's day...not sure if the cinnamon rolls count, but those frittatas DEFINITELY do! Here's to good luck! Yowsa - they were delish! What a great way to start the year - with delicious eats! I was in heaven! All the work in the kitchen this morning must have made me ravenous because I went for a repeat of Round #1 with Round #2. The roll was tender and the icing was nice and sweet. I'm glad we spent the extra money for the mascarpone - it was a wonderful treat! And the frittatas were pretty awesome. I'm definitely making those again. The fresh parsley really gave the eggs a nice pop of flavor. I enjoyed my cinnamon rolls in true Diana-style. I like to my cinnamon rolls by peeling the ring apart and working my way to the middle. We let Bailey get in on the brunch celebration with a mini frittata. I made him do some tricks before I gave him his New Year's treat and BOY did he LOVE it! He was all giddy after eating it. We have special plans for New Year's Dinner, but more on that to come. Are you eating anything special for New Year's? I don't know about you, but working out after not having done it in a week (thanks to Christmas and traveling) is HARD! I forgot my camera today but at least had my iPhone for some evening photos. Apparently my camera hardware continues to slide downhill, from my DSLR (still in the shop) to my Ninja camera (the Canon PowerShot - forgotten at home) to my iPhone (a pretty good camera for a phone, but no DSLR). I had a fab 2 hour zumbalicious workout, followed up with an Aria protein shake. I attempted to take a photo of my zumba hat. Apparently, it is difficult to take self-portraits with iPhones. A fellow class participant helped me out with a shot - muuuch better! Post zumba, some friends headed out to Cantina 1511. We got some drinky-drinks. I had some white sangria (about 1 1/2 cups). It was super yummy and one of the best sangrias I've had! We got guacamole - made tableside! Everything tastes better made tableside! I split a Chicken Chimichanga with my friend Kat. I love finding friends to split food with! Instead of rice and beans, we ordered veggies. We also got some cole slaw on the side. The portion size was nearly perfect, though I did manage to take a small piece of chimichanga home for hubby. Some of my zumba friends will be doing the Eat in Month Challenge in January with me! I'm so excited they're joining in on the fun! Now we'll have to think of some fun things to cook up together since we won't be dining out in January! Flannel sheets - in light turquoise AND Martha Stewart! Speaking of linens, we also got some lovely, light turquoise towels, but I was too lazy to take them out of their plastic packaging to photograph them. The Kitchen Aid Hand Mixer I've been lusting after - in Martha Blue! So pretty! Now my set is complete! Woot woot! My SIL found this for me - a vintage vase...or something? I don't care what it's supposed to be - it's GORGEOUS! It's the perfect vintage light-turquoise color. I will find a good use for it. A BPA-free water bottle in light turquoise (seeing a trend here?) with a beautiful flower pattern. This is the prettiest BPA-free water bottle I've seen. I'm so glad I held off buying the ones I sort-of liked because I LOVE this one! Well, it's sleepy time around here, so I'm off to bed! What was your favorite Christmas (or holiday) gift this year? After my fun bloggie dinner outing, I came home to veg on the couch with my WIP: an amigurumi bunny. I had completed the body, head/face and only needed to make 2 arms, 2 legs, and 2 ears. Once I had all the pieces done, I just had to assemble. Voila! My MIL named her Betty. Betty proved to be very adventurous and promptly started exploring. Since it was late, Betty didn't get very far before wanting to be tucked in. But, in the morning (this morning), she was up early and moving about. I finally found her outside and tucked her away into a gift bag to be opened later. I enjoyed some coffee in a mug hubby and I gave his mom. They are from Starbucks and have a pretty, bright red finish on the inside. I had plans with hubby's fam (his sister and her fam drove in late Christmas night from out of town) to do a lunch later, so I kept breakfast light with an egg and cheese biscuit and piece of chicken sausage. Post-breakfast, we had another round of gift-opening for hubby's sis' fam. Betty found her new friend, Cami (in the red dress), and will be going home with her. Christmas day started slowly for me. I was still feeling a bit under the weather from the previous day, though slightly better. In addition to the whole wheat rolls, hubby and I also brought a loaf of Great Harvest Chocolate Babka. I was itching to try this stuff – it looked so good when I picked it up! Hubby’s mom toasted some of the bread up. I may or may not have snuck a (non-toasting) half while the bread toasted. Then, I had the opportunity to be the taste-tester to verify the bread was toasty enough. I happily obliged. I also got to enjoy a piece fresh from the toaster. I picked the chocolate-iest one I could find. The bread was good plain but boy was it good toasted! The way the chocolate was ooey and gooey…be still my heart! Coffee to wake up and Orange Juice for the vitamin C.
Bailey tried to help me feel better. Per the usual, I had a bit of everything. Then, it was present time. I scored big! I forgot to take photos of the presents but will try to recap some of my faves later. After relaxing in the afternoon, it was time to get ready for the annual family Christmas dinner. I kicked off the evening with some Frenzy Sauvignon Blanc. I snacked on veggies…these pictured and a few not. …while we watched a photo slideshow of hubby’s aunt & uncle’s recent trip to New Zealand and Australia. Such beautiful photos! Makes me want to visit. Then, things got serious in the kitchen. I was in charge of the mashed potatoes. Large table for a house full of family. This year, I had the 8th day of Christmas cup, along with some more wine. My plate #1: salad, roll, dressing, dry dressing (yup, we have 2 types of dressing and the dry one is made by hubby’s mom and famous in this family), real butter, mashed potatoes, turkey, and gravy (made with BEER!). I told hubby’s uncle that next year, hubby may have some brew he can use to make his gravy. Small seconds on turkey and gravy. Proof the potatoes were a smashing success! More QT by the Christmas tree. Hubby and I received some generous gifts from our fam for our house: some gorgeous light-turquoise towels (a full set of 2 – bath, hand, and wash towels) and a Martha Stewart (yay!) light turquoise flannel sheet set. After gift-opening, it was time for dessert! and a sugar cookie with a turquoise peace sign. I managed to eat this one all by myself! Decaf coffee with milk and sugar…I love the way coffee tastes with dessert. Hubby, the used-to-not-drink-coffee-one requested the coffee this time and I’m glad he did. Aren’t these spoons they served the coffee with beautiful? I hope everyone had wonderful holidays and Merry Christmases this year! Bailey was a happy camper on his new bed on the car road to Dan’s hometown. I brought over a gift from my parents to Dan’s mom – a goodie basket from Whole Foods with lots of yummy treats inside. I worked on my amigurumi bunny. I know, I know…I’ve been working on this thing for FOREVER! Most people make a few of these in one sitting, but I am…alas, not quite as quick and typically don’t devote as much time to crochet as I’d like. 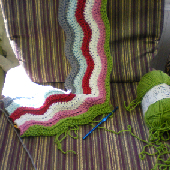 That’s one thing about holidays I love – having lots of time to sit around and do things like crochet or read. Dinner was a hamburger stroganoff casserole. Served with some Great Harvest whole wheat rolls hubby and I gifted Dan’s mom – she toasted them and buttered them up to go with dinner. We also had salad and beans. For dessert – pecan bars. They reminded me of the Ina Garten pecan bars hubby and I made for Christmas dinner last year. Remembering how rich they were, I had a tee-niny square. I actually started feeling a bit under the weather post-dinner. Not nauseous or anything…just really, really, really…drained. Tired. Zonked! Hubby, his brother, and his mom decorated their Christmas tree whilst I laid around reading The Lovely Bones. How good is that book?! I’m currently 2/3 done and kind of sad it’s coming to an end. I love checking out all the different types of ornaments people put up in their Christmas trees. And my MIL even has these neat bubbling lights. They’re very interesting. Hope everyone (who celebrates it) had a lovely Christmas Eve! I took a secret outing today to pick up one of hubby's Christmas gifts. Looks rather random from the outside, no? Inside, I met none other than our own Queen City home-brewing expert - Matt! Hubby has been talking to Matt a lot lately about brewing beer, and Matt was kind enough to put together a recipe for him and even pick out the items he'd need to brew his first batch. Thanks Matt - you're the BEST! Once I got home, I wrapped hubby's gifts and stuffed hubby's stocking with his mini-treats. We decided to go ahead and do our Christmas and open each others gifts. I got another piece of the Martha Blue kitchen set - the BLENDER! Time to make more smoothies! Hubby loved his brew kit. I hope he and Matt are able to get together soon...I know they will have a blast! Even though I had picked up some organic chicken earlier at TJ's, hubby suggested an impromptu dinner out. Hubby and I even valeted our car...a rarity for us. The restaurant validated valet parking, so we took them up on the offer. It was pretty nice not having to walk to our car pre and post dinner. We had 2 $25 gift cards for Flemings, which we received at my company holiday party, so we decided to go ahead and use them. The restaurant was nice and intimate inside. Our waiter helped me select a glass of the B. R. Cohn, North Coast Silver Label, 2006. I was very pleased with the wine - it was nice and smooth and went perfectly with my dinner. To start, we were served some herbed bread with 2 butters: sundried tomato and garlic + champagne infused brie. Wow...so good...I didn't want to stop eating it! I decided to order the Fall Prix Fixe menu. Hubby started with a Caesar salad. I had several bites and loved the zing it had. My first course was a roasted butternut squash soup with gingered creme fraiche. Hubby got the Steak au Poivre with BBQ shrimp. I got the Filet Mignon Brochette with Roasted Tomatoes. WOW! One of the BEST. STEAKS. EVER! Seriously...it was like butter! It just melted in my mouth. Again, I didn't want to stop eating it, but I did manage to stop eventually. The steak was served over pesto mashed potatoes...also delicious. I got roasted tomatoes with parmesan for my side dish and shared with hubby. Decaf cappuccino with a sugar cube and cinnamon sprinkle. Dee-lish! I added the sugar cube but decided to try to let dessert be the sweetener with sips of my frothy coffee. Dark Chocolate Mousse cake with almond brittle and malted creme anglaise...holy wow! So good! Perfect-o with that cappuccino! Wow...we were STUFFED after dinner! I'm so impressed with Flemings. The quality of food and the service were both impeccable. We'll definitely be back. We shopped at Best Buy and Target after dinner to walk off dinner and get the last of our Christmas gifts. In random news, I called and checked on my camera today. My DSLR has been assigned a technician...I hope whoever they are, they can fix my camera soon! I had plans to use it starting January. It's almost Christmas time! Are you ready? They've mentioned how my pumpkin oats look really yummy, so I got the idea to do a Chic Breakfast Kit to get them started making their own delicious Chic-esque breakfasts. I made these a couple weeks ago, but I couldn't post this blog until I gave them their gifts, though, otherwise, they'd know what I got them! So, what's in a Chic Breakfast Kit, you ask? Well, first let's start with the outside - an adorable Christmas-y bag. Hubby actually picked these out for me, along with the coordinating tissue paper. Gotta give em something to tote their goodies in. golden flaxseeds, and chia seeds. Basically, all of my favorite base goodies to make breakfast, whether it's oatmeal or toast (my two main AM eats). Either way you're getting a good serving of whole grains and some other goodies to boot. I made 3 kits for my zumba friends. Now those will make some good breakfast, eats, no? Just add milk, water, sweetener of choice for perfect oats. Add nut butter, jam, real butter for a quick toast breakfast. Nut butters make a better combo with the bread so you get your protein and carbs. Best to add some protein/nut-butter to the oatmeal, too, for that matter! The saying "Better late than never" is true, right? Right! This morning I worked on some last minute Christmas cards over breakfast. I know Christmas is later this week, but...I dunno...it just sorta...slipped my mind? I'm going to go ahead and blame being so busy at work. Yea...that sounds good. It's all work's fault! I finally got to use the Christmas mug I got as a gift. It's so cute! This mug is the perfect holder for a brew of 1/2 Christmas Blend and 1/2 Peppermint Creme. Yum! I talked hubby into eating some oatmeal with me by offering one of his fave combos: PB + Chocolate Chip. I heated milk, flaxseeds, and unsweetened cocoa powder to a boil and then cooked extra thick oats and about 1 tsp agve syrup in the mixture till the right consistency. I served the oats into two bowls. Hubby's was topped with a sprinkling of sugar and non-dairy chocolate chips, sliced almonds, with a spoonful of that fresh-ground honey roasted PB. Mine got the PB too, but the rest of my toppings were different: no sugar, yes PB, yes almonds, sub vegan carob chips. I could barely finish this bowl of oats...it was HUGE! 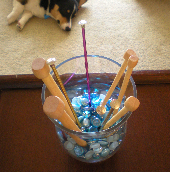 I'm off to finish my cards, maybe do some house stuff and then have some yarn-y fun with my zumba friend Kat. Cheers! I went to two lovely back to back dance-work out classes tonight! My friend Megan (an instructor), let me lead Whatever You Like...Holla! Thanks Megan! Unfortunately, mid-way through out last class, a student rushed in the room to inform us that her car had been broken into, and they stole her purse. After class, we came to realize that TWO more cars had been broken into! Thank God mine was not one of them, but I almost parked where one of the cars had been. Really, I did park in nearly that same spot, but I thought the space was too far from the building, so I noticed a few people leaving, and I waited for someone who was parked closer to leave. Once they did, I moved my car closer to the building and to more lights. Bottom line is this - please be safe out there at all times! Bad things happen at some of the least expected places. My friend was robbed at gunpoint at the "ritzy" mall in town. Never leave anything valuable in your car - ESPECIALLY not in plain sight! Even if you have something like a gym bag that has nothing worth stealing inside, don't leave that out! Thieves don't know there's nothing worth stealing in there and may break into your car just to find out if there is. Don't even leave something as small as a cell phone charger visible. If you HAVE to leave something in your car, put it in your trunk (or out of sight) BEFORE you arrive at your destination. If you put something in your car when you park, someone may see you doing so and know to check your car when you're not there. Safety in numbers - if you're leaving somewhere (a gym, a mall, etc. ), try to walk out with someone else. Try to park as close to the building (or location) as possible. While I sometimes park further away from stores, etc to "not be lazy", I think safety should come first - especially if you're leaving when it's dark outside! Sometimes you have to be patient finding a safer spot, like I did tonight. Anyone else have some good parking lot safety tips they'd like to add? Anywho, I stayed after till the cops got there and ended up eating a suuuuper late dinner! I try to eat meals no later than 9pm, but tonight, I didn't eat till 10:30pm. I tried to keep things semi light and used items I had in our pantry/freezer. I've been itching to try these Vegetable Masala burgers I've seen at Trader Joe's for the last couple months and finally picked some up recently. Luckily, dinner only took about 10 minutes to whip up. I had a veggie masala burger, some peas with a dab of real butter, a slice of Great Harvest honey whole wheat toast with Earthfare pomengranate jelly. My friend Megan got me a prezzie tonight! I LOVE the adorable bag! Inside....EEEK! One of the cupcake books I've been oggling for years! Literally...I think I've tried to buy this book a couple times of the last couple years, but the wait is over! Hello, Cupcake is mine! Thanks Megan! While I was working out, hubby was sweet enough to pick up the present my parents gave us (yup, it's for me AND him) money for - a food processor! Not just any food processor, but the KitchenAid 12 cup food processor in Martha Blue! I've been infatuated with this set since seeing it in Macy's...the color is my fave! One day, I'll have the whole collection (maybe sans the mixer)...when we can afford it. I'll take the food processor for now. I've been wanting one of these for a looong time, too! Wow, so many great food/cooking/baking related gifts! Guess I I know what I'll be doing next week! Thirty minutes after getting back to town from my parents, I had to throw on a change of clothes and put on make up for a Holiday Pot Luck with my zumba friends. Our head instructor hosted a casual pot luck at her house. There were TONS of people there! There was TONS of food, too! Too much to name everything. I tried to make a healthy-ish plate: tortilla chips, guacamole, spinach dip, rice, salad with green peppers, carrots and broccoli. I managed to hold myself back from most of the sweets. I did dig into some of my mom's Christmas cookies - just a couple. Really, I've been grazing on these all day. They're deceptively tasty. So nice seeing my zumba friends outside of class! Fun times! After the pot luck, I came home and had a small piece of the leftover Christmas dinner turkey my parents sent us home with. ...with some Trader Joe's Vanilla Soy Milk. I still think Soy Dream is the best, but this TJ's stuff is pretty good, too! I have the next two weeks of work off! Haaaaa-llelujah! It's been too long since I've taken a nice chunk of time off and especially with the new house, I really need a lot of time in the house. We're spending a few days with hubby's fam, but I'm hoping to get lots of good work done in the house and make some me-time, too! The weather this weekend just kept getting better and better. Though we had Christmas dinner with my family on Saturday, we did our gift-opening on Sunday. First things first...I had to take Bailey out for his morning stroll. The moss looked like something from Avatar! I almost expected it to light up when we stepped on it! Hubby and I are slackers in gifts sometimes and bought most of our gifts yesterday. We ended up wrapping up our gifts Sunday AM. lol...nice, no? I hope to do better next year. I gave hubby some gift-wrap tips. Breakfast potatoes - made from scratch! Bailey didn't love sitting off to the side. He wanted to be at the table! I had a little bit of everything, as per the usual. I tried some of my family's homemade peach preserves. They made this using peaches they picked from a farm. After we were done eating, we did have a special gift for Bailey - a snowman shaped doggie treat! We opened our stockings at the table. I scored with a slew of dark chocolate goodies, tea, a tea strainer, an eyeliner shaver and some nail files. I was super curious about the Endangered Species Organic Dark Chocolate with Goji Berry, Pecans, & Maca. My sister requested and received a stocking full of these Indian cookies - Parle G. She found out about them from a co-worker and LOVES them. Before moving on the gifts, dad, sis, and I brewed up some tea to sip on. They had Celestial Seasonings Raspberry Zinger but I chose the festive Tea of Good Tidings by The Republic of Tea. I thought it was the perfect brew for the occasion. We let Bailey open one of the gifts. Turns out he's pretty good at gift opening. After opening a gift, Bailey observed from the couch. Got some good goodies and money to buy something special (more on that to come). Bailey helped my mom test out her present - a gel mat for the kitchen. Mom used the mat to bake cookies. Lots and lots of em! She sent us home with leftover turkey, a parsley plant, our gifts, goodies, and plenty of cookies. Check out one of my Christmas gifts - Eat, Drink & Be Vegan by Dreena Burton of Vive Le Vegan ! I'm so happy to have received this book - I've heard great things about it on the blogosphere. I can't wait to try out some of the recipes! Speaking of vegan...Guess who may be going vegan?!? No...It's not me. My Dad may be going vegan for his health (as in to be more healthy). I'm fully supportive of this and would love to see what kinds of vegan concoctions he comes up with! He says he may try to go vegetarian first and work his way to vegan. Dad and Mom have already started incorporating some vegetarian and vegan cookbooks into their collection. Maybe they'll have some good tips for me?! :) Either way, I think it's pretty exciting. Thanks for the fun weekend, Dad, Mom, and Sis! Hope to be back soon! Dad has really had to watch his health lately. He’s always been a healthy eater, but lately, he’s had to be extra careful. Just like Thanksgiving, we gave our Christmas dinner a healthy makeover. Dad did a take on an Emeril recipe to healthify our turkey. He’s asleep so I can’t ask him exactly which one, but I bet he based it off this one, except with his homemade stuffing + cranberries in the filling. The steamed potatoes are served on the main platter next to the turkey. We also enjoyed a nice side of sauteed kale. Though I made the kale at Thanksgiving using my own recipe, Dad opted to use one out of Bon Appetit. He said it was basically the same as mine sans chicken broth. Healthified? : Probably not so much. One day we’ll make our own cranberry sauce, but the turkey was a big enough adventure for one day IMO. Great Harvest Dakota toast – 2/3 with a light dappling of real butter 1/3 sans butter. Healthified: a vast improvement over the standard white dinner roll. This bread features fresh-ground wheat, nuts, and seeds. Note my nearly full plate and hubby’s empty plate…lol. He’s such a fast eater. I like to think my slow eating helps me gauge my fullness nicely. Christmas decor on the buffet. I prepped up a healthy berry crisp for dessert, though I did add some butter to the top to help it brown. Healtified: used whole wheat pastry flour, light on sweetener, subbed some sugar with honey, fruit serving, topped with sliced almonds. Too good to not have seconds! Anyone else having more than one Christmas dinner? Hubby and I woke up late-ish, but thank goodness we got to sleep in at least a little after our late trip in to visit my parents. Mom whipped up a quick breakfast: fried egg, piece of Great Harvest Dakota toast with real butter. My parents informed us we still had to go out and get our turkey for our Christmas dinner, so a trip to Whole Foods was in order. Unfortunately, the weather was not cooperating and was horrible outside! Nearly-frozen rain was pouring out of the sky and we weren’t sure when it would start turning to ice on the roads. We braved the weather and even stopped at Mimi’s Cafe for a quick lunch. I took a bunch of photos on my iPhone but for some reason, my sister’s computer isn’t able to get the photos off my iPhone, so I’ll just go verbal here. I got the endless soup and salad with a green salad with a balsamic vinaigrette dressing, 1 small bowl of vegetarian veggie soup and 1 small bowl of French Onion soup with an Oat Bran muffin. Everything was quite tasty, though I did overdo it trying to finish that HUGE muffin! After lunch, we hit up Whole Foods. How jealous am I that we don’t have one of these in town!? The Whole Foods was awesome, though I was a tad disappointed they didn’t have the juice bar like I’ve seen at others. I was planning to order something! Though I did manage to hold myself back from buying more stuff than I can take back home, I did get some fresh-ground honey roasted peanut butter – can’t wait to try this stuff out! After WF, we headed home as soon as possible to de-frost. My parents used to do the traditional hodge-podge tree with a random assortment of sizes, shapes and colors of ornaments. Over the last couple years, they’ve done a white, silver, and blue tree, which I think is really pretty. They always hang our “Teddy ornament.” We got this ornament when we had our German Shepherd, Teddy, who passed away a few years ago. 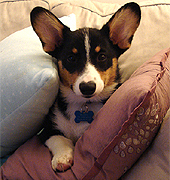 He was an amazing dog and friend and family member, and we miss him terribly. To help with our de-frosting, I made some hot tea. I went with a family favorite – Celestial Seasonings Sleepytime. The flavors are so simple and mellow, but I love them. I think it’s almost time to start dinner, so I’m going to head downstairs and see if I can help out. NOTE: Finally caved and downloaded on hubby’s and my sister’s (non Mac) computers so I can blog away from home. Not loving what it’s doing to my code, but I guess that’s just the geek in me. Some days I don’t know what I’m thinking trying to accomplish as much as I do. Things started off with a nice breakfast of Choco-Banana-Date Oatmeal with Christmas Blend coffee. Bailey was fast asleep on the couch while I munched away. At work, we had our small but mighty holiday pot luck. My cookies! (Like you expected me to bring anything else! lol)…My healhtified Oatmeal Butterscotch cookies. I quickly loaded up a plate with a little bit of everything…savory first, though. I don’t like my salty and sweet to touch. I had to make room! My sweet plate – a little bit of everything again. I even got a box of chocolates to take home as a party favor. I traded around to get some more caramels and added in some Cookies and Cream bark for hubby. Gosh a ladybug just started crawling around the keyboard out of nowhere! Kind of scared me, but ladybugs are one bug I can tolerate. Plus, they’re lucky! And I can always use some more luck! Luckily, the point and shoot hubby got me awhile back is pretty darn good, so I managed some decent photos today. I had an old-favorite I haven't had in awhile for breakfast today - TOAST! Normally I do a nut butter on my toast, but today, I let my Morningstar "sausage" be the savory to my sweet toast. I topped my toast with pomegranate jelly and Dark Chocolate Dreams. I love how easy a great piece of whole wheat bread can make getting a serving of whole grains. It was suuuuper foggy outside today! The fog was supposed to go away late morning, but it stuck around all day long. Perfect day for grass-fed pot roast leftovers with organic veggies and brown rice. I got a present at work today. I didn't even see it coming! So nice to have such friendly and thoughtful co-workers around, no? ...and the CUTEST mug! I love the size, shape, and the little skating snow guy on the front. White pomegranate tea to ward off that darn yucky foggy weather. A White Chocolate Chunkies cookie for lunch-dessert. I brought the last of my cookies in to work to spread holiday cheer to my co-workers. They went pretty fast! Zumba fuel=WW toast with Barney Butter. Toast twice in one day...you bet! What can I say...I love my carbs. Fab-oo 1 hr zumba workout tonight with my zumba pals. Instructor Megan even dropped a song on the playlist to make sure I could come up to the front. Thanks Megan! SO FUN! Being in the front is awesome...especially when you know the choreography and aren't worried about totally effing up the class by demonstrating the wrong thing...lol. Terriyaki rice ball bite - shared by Kat - Thanks Kat! Forgot to photography my Cali roll with Masago. You guys know what it looks like, though! What are you most looking forward to doing during your holiday vacay? Hubby and I spent a lovely Saturday night at a holiday party with friends, including Kath, Matt, and Sarah, at Ben + Michelle's holiday party. Luckily, I didn't have to worry as much as I did for my company holiday party in the attire department. I wore some skinny jeans and a Christmas-y red sweater. Doggies were even invited, though holiday attire was required, so we brought Bailey along. The dogs looked adorable in their little costumes, though. Ben + Michelle had their house festively decorated with tons of candles galore. Tons of great eats, including: pigs in a blanket, cheese dip, shrimp cocktail, deviled eggs, and a fab Wisconsin cheese platter brought by Kath. My plate - a little bit of everything. I even tried the blue cheese! I normally don't like blue cheese. I think it smells like dirty socks. However, I recognize that blue cheese is widely recognized as a great cheese and since I don't like to limit myself, I try to eat it every once in awhile. I shoved the cracker in my mouth before I could catch a whiff of the smell (though I've found somethings blue cheese is smelly and sometimes not at all - I didn't want to risk it) and I thought the flavor was really nice. There were lots of great sweets, including: the White Chocolate Chunkies hubby and I made earlier that day, oreo treats, peanut butter balls, and peanut butter bites. My plate (feeling pretty full after hitting up the savory eats, so I just tried a couple): an oatmeal cookie, a peanut butter bite, and an oreo treat. The Wii was popular all night. We even played Super Mario! How bout that for a blast from the past? Thanks Ben + Michelle for having us over! We had a great time! Happy housewarming, Happy Birthday to Michelle and Congrats to Michelle for running her first half marathon! I love to make stuff for Christmas gifts. I love to buy things for people too, but the creative side of me has fun putting things together and getting all crafty. I've always wanted to mix up a bunch of those layered-cookies-mixes-in-a-jar type things, and we say we'll do them every year, but never quite get around to doing them. This year, we decided to go ahead and try out one of the "homemade mix" recipes I found online for Hot Cocoa Mix. I found a great-looking recipe with good reviews online (click for link and recipe). Hubby was in charge of measuring and mixing the ingredients. He also picked up these holiday mugs at Crate + Barrel. I was in charge of packaging. I found some decorative ribbon and red scrapbook paper. I used a punch-tool to cut out 2 circles per bag of hot cocoa. I wrote "Hot Cocoa Mix" on one circle and the directions on the other. I taped a ribbon wrapped vertically around the hot cocoa bag (with the top folded down). I placed the circles on top of the ribbon seams to cover them. I filled the mugs with shredded red paper. The cocoa bags went into the mug. I added candy canes (to stir the hot cocoa). Voila! A Hot Cocoa kit. Just add boiling water! Are you making anything for Christmas gifts? White chocolate chips and candied cherries. The recipe requested white chocolate "chunks" but it was either chips or a bar at the store and I figured using the chips would save me chopping time. Now the recipe didn't say anything about chopping the cherries, but they were pretty big and I like a bit of each flavor in every bite, so I chopped mine to more evenly distribute them. Hubby had to help me stir the chips, nuts, and cherries into the batter, which was extra-stiff. I think the mix was 50% batter and 50% chips/nuts/cherries. I used an ice cream scoop to distribute the batter, which helped make sure they were all equally sized. I checked the cookies and they were totally browned on top. Not burnt but way further cooked than I like my cookies. Hubby and I did taste-test one cookie each and we still liked the flavor, but I think they really would have been better if they were slightly chewy. I love chewy cookies. I can't wait to bake/cook up some more goodies for our friends. Hmm...what to make next? Last night was my company's annual holiday party. They always put on a great show and take wonderful care of us. As I said yesterday, I didn't have anything to wear and didn't want to spend money on buying something new, so I just shopped my closet and came up with this. Not my best work, but I just really wasn't feeling a dress and I ALWAYS wear a dress to my holiday party. Stupid cold weather! I wore some dressy off-white pant with a simple black sweater so I could showcase my statement-necklace. I also wore some festive metallic mary jane heels. The party was at Flemings, a steakhouse in town. Upon arriving to the party, we were greeted with a variety of appetizers. I should have tried one but was saving room for dinner...and dessert. I started with lobster bisque. I'm not a big seafood person, but I'd like to learn to like seafood more, so I try it out every once in awhile. The soup was really, really good and I downed the whole bowl. Others at the table got the wedge-a salad with blue cheese. For the main event, I got the filet. The sides were served family style: mushrooms, potatoes gratin, and snap peas. I had a little bit of everything. Even a mushroom! Mushrooms are another thing I don't love but I'd like to love. This little guy was pretty good! Steak was a popular choice at our table. Boy was the steak good too! Well seasoned and super tender. Yum! All the sides were really good too. Hubby was a BIG fan of those potatoes. Coffee (with a smidge of Baileys) to go with dessert. The dessert was served family style too: chocolate mousse cake, creme brulee, cheesecake. They were all amazing. I have to say my (surprise) fave was probably the cheesecake! It was lighter than others I've had and had a great flavor. As we wrapped up dessert, we started on our Dirty Santa game. I pulled a decent # - 12. You don't want to the first for sure! I "stole" a Red Apple Wreath candle from my boss (he didn't want it!). It was a Yankee candle and those things are expensive! The gift we brought was a pretty good gag (and kind of useful) gift: nosehair clippers! We also gave a $10 gift card to the ABC store. We had a surprise round of Dirty Santa with all new gifts. Santa brought them! For round 2, I scored some Godiva chocolate and a gift card to the mall. Yes! My loot - we all also ended up getting a $25 gift card to Flemings, too! The restaurant gifted them to us. Hubby and I had an awesome time and great dinner! Loved my gifts, too! If you had one, what did you do for your holiday party? With a late phone conference today, I decided to spend the last part of my work day working from home. I rarely work from home or have the chance to run errands during the day, so I almost always take the opportunity to hit up a local bakery on my way home from work. I picked up a pretzel twist for hubby and a mini "texas donut" for moi. With decaf...mmm...nice and warm! That was too bad too because the squash was a PAIN to prep! Mostly it was difficult because of my measley peeler. I think I need one of those that is shaped more like a razor with the blade at the top instead of a long knife-like one like I had. I barely could get through the skin with mine! I finally figured out if I rubbed it back and forth quickly it came off easier, but I was TERRIFIED I'd end up cutting myself accidentally and proceeded as carefully as possible. Since I was having dinner solo, I decided to go ahead and dig into some Trader Joe's Organic Firm tofu I had in the fridge. I actually prepped my tofu before getting started on the squash since it needed to marinate. Check out the heart in my tofu marinade! I'm seeing hearts everywhere lately! Peas. I used to hate peas, but now I LOVE them! Yum! So fresh and so clean-clean...clean eats that is! The polyurethane smell in the house is driving me crazy! I found these Bath & Body works wallflowers replacement bottles in a box, but not the attachments. Not until tonight at least. I decided to figure out where the heck they were so I could get them plugged up. I placed a "Fresh Linen" in the living room and a "Sea Island Cotton" in our bedroom. I used to be completely obsessed with these wallflowers when I was in college. Cotton Blossom (the original, not the Sea Island) was my signature scent. I loved how fresh and clean it smelled...like a warm, sunny day. I didn't use them much in the apartment, but I see them becoming popular on the house-front once again. I wish I had some more fall-like scents, though. Hmm...shopping to Bath & Body anyone? I think I need some mini ornaments for my silver Christmas tree. This little reindeer needs no extra decoration - he's so cute! After our shopping trip, I made a quick and easy dinner of spaghetti and meatballs. So easy! I was trying to conserve time so I could decorate our tree and we almost caved and got pizza, but decided to eat in instead. I was so glad we did! After dinner, we got started on the tree. We started with lights and tinsel. Put up our faves and unusual ornaments first, ensuring they get a great spot on the tree where people can really see them. Our new Pottery Barn 2009 silver snowflake ornament, representing our first year in the house. A 2008 Hallmark ornament with penguins (we love penguins! ), representing our first Christmas married. A glittery starfish ornament we purchased at the Atlantis in the Bahamas on our honeymoon. A shabby-chic ornament I got from a blog friend. A glittery heel, representing the shopaholic in me. A glittery, turquoise-y snow(wo)man. I made these in 2007 - they were a fun project! Bailey Claus made an appearance. Ta-daaaaaaah! Christmas tree has been decorated! Bailey was hanging out with me when I finished our tree. I cuddled up with him and we sat and enjoyed looking at our decorated tree for a bit. I couldn't help but think how awesome it was to have our first Christmas tree in our first house and feel blessed. More holiday decorations went up. I broke out some of my fave turquoise, holiday, kitchen towels. A festive holly apron draped on our makeshift pantry. A day of Christmas tree decorating wouldn't be complete without some hot chocolate and chocolate. I couldn't resist trying some of these Trader Joe's chocolate truffles. Boy were they good! I managed to only eat two of them and savored every tiny bite (I like to take itty-bitty bites of foods - especially desserts so I can really take my time enjoying them). Microwave water in mug for 30 seconds. Add cocoa powder to water and stir to mix (make sure cocoa powder is completely mixed in). Add agave and stir to mix. Meanwhile, (after removing water from microwave) heat milk in microwave till hot to liking, about 1 1/2 minutes. Add milk to chocolate mixture and stir to combine. What are your traditions for Tree Decorating? Hubby and I set out late morning to get our Christmas tree. I've wanted to establish a traditional weekend for getting our Christmas tree, and since we're always out of town Thanksgiving weekend and I don't like to get into Christmas before Thanksgiving, the weekend after is our first opportunity. That would be this weekend! I decided we should hit up the tree tent where our local farmers market is held. The farmers, Horse Creek Tree farms, use less pesticides than many other tree farmers, which I appreciate. We had a fun time tree shopping, but boy was it cold outside! The funny thing about Christmas tree shopping is that the more you shop, the more all the trees start looking the same! I wanted to get a 6 foot tree, but hubby suggested we go 5-6' this year and up next year. I accepted his proposal and we found a great tree in no time! ...and pushed the tree through some netting, which made it waaay easier for us to fit our tree in our car. We actually got it in the back seat! (with the very tip top sticking out the window just a wee bit. We got our tree setup in our stand (with some cardboard to protect our hardwoods) but I had to wait all day to decorating! Boo! Have you gotten your tree yet (if you celebrate Christmas)? Have you put up any decorations yet? Today, hubby and I headed over to hang out at Kate and Nate's house, along with Caitlin, Jason, Amanda, Justin, Kath, Matt, Michelle, and Ben, for a Holiday Movie Marathon. I was so busy with the CPR/AED/First Aid certification, grocery shopping, and cookie baking, I forgot to eat lunch. Doh! So I had a bunch of snacks at the party for a late "lunch". Oh how much did I LOVE the cozy fire?! I got cozy on the couch with my plate full of food: pita chips + hummus, baby carrots, cherry tomatoes, mini quiche, pig in a blanket. I think these desserts deserve some close-ups! I enjoyed my eats with Elf! Hubby and I saw Elf for our first date, so the movie holds a special place in our hearts. After Elf, we turned on Christmas Vacation. I had plenty of salad and 2 small pieces of pizza - one of each flavor (Margharita and cheese). I also had another one of those butter cookies. They were so good - like little pillows of deliciousness! I also enjoyed a little Hot Apple Cider with dinner. Yum! Such a great festive drink! Gilbert made a guest appearance! I totally want some of these cinnamon-scented pine cones for my house! They smell awesome and are pretty, too! Kate said she found them at Target if anyone is interested. A little Prosecco to end the night. Check out Kath's recap here. Thank you soooo much Kate and Nate for having us over! We had a great time and are hoping to see another movie marathon next year, if not sooner! After my most-awesome breakfast, I was ready for a long day of phone conferences and my company's Food Day! Food Day is the day each of my co-workers brings in a food item to share with the rest of our group. Most people cook things, but home-cooked foods are not required...just food. I decided to make today a grazing day, but didn't get to graze very far thanks to being locked down at my desk with phone conferences. I started my grazing around 9am with a Chick Fil A Chicken Mini and a Dunkin Donuts glazed donut hole. I baked Oatmeal Butterscotch Cookies last night for Food Day and my Holiday Cookie Challenge. I went ahead and got my cookies out on the Food table so they'd be available for my co-workers. Around 10:30 am, I went for some home made banana bread...yum! We had quite the array of options today! In the mix: meatballs, macaroni and cheese, rice with bacon and chick peas, salsa and tortilla chips, sausage balls, pecan tassies. I had a 20 minute break in my day (yes, only 20 mins from 10am-4pm) from my phone conferences and it just so happened to line up perfectly with when we hit up the food table! My plate: salsa and tortilla chips, bacon rice with chick peas, macaroni and cheese, chili (was looking for this since I enjoyed it so much last year), empanada (a Food Day staple for me...LOVE!). Seriously, these empanadas as the shiz-nit! I wanted to go back for seconds, but after overeating last night, I knew I wouldn't be happy if I stuffed myself too much again. Plus, I had to save room for dessert! I had a little ginger ale with lunch. My dessert plate: apple slice with caramel, lemon meringue pie, oreo white chocolate ball, pecan tassie. All the desserts were awesome, but I am a big fan of pecan tassies - some of my fave flavors. The Oreo white chocolate ball was a nice surprise...so decadent but good. My new zumbawear arrived today finally! I ordered this when it was on sale this past weekend and couldn't wait for it to get here! I decided to go ahead and wear some to tonight's Zumba Christmas Jam party! We were supposed to dress Christmas-y, but I didn't really have much to wear and didn't want to spend money buying something for the party, so I decided my zumba pants with a red tank top would suffice. I'm like a big kid when I get new stuff. I have to tear into it and check it out, play with it, wear it, use it, whatever! I put on as much zumbawear tonight as my body would hold. I also wore my new zumba hoodie. It was slightly tighter-fitting than I expected and not quite as stretchy as I would have liked, but it was super cute! Check out the "LOVE" with the zumba logo! There's also a logo on the hoodie head part. So much fun dancing the stress of the week away! I worked up quite the sweat and got down to my new zumba short top. I love the fit of the top! So comfy and I love the V-shape across the chest. I also adore the LOVE and zumba logo on the back. So cute! After class, I went with my zumba friend Kat (Hey Kat!) to grab dinner. We hit up Jason's deli and I couldn't resist my new fave combo: turkey reuben, steamed veggies, and French Onion soup. You know, I used to not like French Onion Soup because I thought the swiss cheese smelled funny, but Jason's Deli uses provolone, which I love. The cheese is mild and gets uber-gooey all melted down. Yum! I even made Kat try some (even though she said she didn't normally like French Onion soup) and she admitted she thought it was pretty good, too, and would consider ordering it in the future. I got a mini ice cream swirl sundae with dark chocolate syrup. Ahh...so nice having some good quality girl time! I came home to a happy puppy who wanted to cuddle. He was pretty sleepy. After settling in, I decided to have a wee bit more chocolate - 2 Trader Joe's dark chocolate wedges with some warm milk. I think warm milk is so comforting. Tomorrow, I'm doing CPR training so I can be 100% AFAA certified. Then, I'm headed to hang out with The Blog Stalker, Pinky, the Hungry Wanderers, and some more friends. Can't wait to see Elf and my friends! 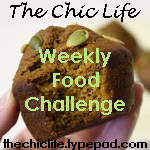 Thanks so much to everyone who participated in my Thanksgiving Food Challenge this year! I'll be doing another challenge in December for the holidays, so stay tuned for details on that challenge if you missed out on the Thanksgiving one. I put the names of all the entries on a tiny piece of paper and then into a bowl. Bailey wanted to help out, so I took him up on his offer. 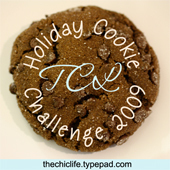 The Thanksgiving Food Challenge 2009 winner is...ERICA from Itzy's Kitchen! Congratulations Erica! Email me at thechiclife at gmail dot com to pick out your colors! Thanks again to everyone who played and stay tuned for details on the Holiday Food Challnge 2009 (same idea as this Thanksgiving challenge, but for Christmas, Hanukkah, or any other holiday you may be celebrating in December). Before I even thought of the Thanksgiving Challenge, I knew I wanted to do something on the healthy side this Thanksgiving. I decided that this year, we'd make Thanksgiving a "healthy indulgence." I knew I wanted to make over as many dishes as possible erring on the healthy side, for the health of me and my family. I even proposed my idea to Foodbuzz for 24, 24, 24, but alas...I did not win. My whole family got together to cook. We had a great joint effort! Sweet Potato Casserole - a healthy recipe my sister found online at eatingwell.com. Dad's dressing. My dad actually shocked me by using white bread (he is the biggest anti-bleached-white-bread person I know!) in the dressing. Luckily, we used plenty of veggies and fresh herbs from my parent's garden. After the turkey was done, the casserole and dressing cooked away. My parents picked up some organic kale for me to cook. I couldn't help but notice how pretty the water looked welled up in the back of the kale leaves as I washed them in the sink. So sparkly! Buttermilk mashed potatoes with a dab of real butter for flavor. We used whole wheat pastry flour to make our gravy. Tofu pumpkin pie! My sister used a flat blade to ensure the pumpkin pie was COMPLETELY flat. The pumpkin pies baked away while we enjoyed our dinner. Bailey was very attentive, though we did make him sit to the side. Makeover - as much fat skimmed away as possible and whole wheat pastry flour subbed for AP. Makeover - mashed potatoes made with healthier buttermilk and with small dab of butter instead of lots of cream and butter. Makeover - no makeover here...maybe next year? Makeover - used tofu instead of eggs/milk/cream/cream cheese/etc. I took a little bit of everything (as much as possible) for my Round #1 (see Easy Ways to Make Thanksgiving a Healthy Indulgence). Everything looked so good, I wanted to pile my plate with food! Instead, I forced myself to take tiny portions (look at the corn...that's like only 1 tbsp worth!) but I was hoping my tiny portions would pay me back with seconds. Turns out I'm better at portioning than I thought because I was feeling pretty full after Round #1 and decided to hold off on Round #2 for awhile. After relaxing at the table for a bit, I decided to go in for Round #2, but this time, I had one target in mind - that Sweet Potato Casserole. Yum! After letting a couple hours go by, I was ready for dessert. Tofu Pumpkin Pie! I enjoyed dessert (with a bit of skim milk) while catching a movie (the new Star Trek) with the fam. Holy wow is tofu pumpkin pie good or what?! It tastes just like regular pumpkin pie! Hubby saw our recipe laying out and got freaked out by the pie. I talked him into trying a tiny slice, doused with tons of whipped cream. I'm so pleased with Thanksgiving this year! The food was lighter and I still got to indulge without feeling horrible afterwards. The best part...my family got to enjoy the healthy indulgence, too! What a wonderful thanksgiving with family and great food! So much to be thankful for! I've received several emails asking me for tips on healthy eating/lifestyle, and I'm happy to oblige! I figured I'd start with the next big event - Thanksgiving! Do you wonder how to eat healthy at Thanksgiving? Do you find yourself using the holiday as an excuse to eat poorly or overeat? Read on for some tips to make Thanksgiving a healthy indulgence. NOTE: Please consult your physician for professional advice. The following are just my personal tips and opinions. Problem: Sometimes your eyes are bigger than your stomach. This is what my dad calls having "big eyes." I've been guilty of having big eyes many times before. I've filled my plate full of yummy food only to get halfway through and realize that I'm absolutely stuffed! If you're like me, you don't like to waste food, so you feel obligated to eat everything on your plate, even when you know you're full. Solution: Try to make your plate more of a sampling. Take less food than you think you can eat. You can always go back for more, but it's hard (if not impossible) to put food back from your plate to a serving dish. After finishing your first round of eats, you may be surprised at how full you feel. I like keeping each round small so I can go back for seconds...or even thirds! Getting another round of food can be fun and your family may be honored that you liked their food so much you went back for more. Problem: There are too many sweets around. I want to eat ALL of them! Solution: You have to be picky. When provided a veritable smorgashborg of delicious dessert options, if you're like me (and you guys know I have a HUGE sweet tooth), you'll want to try one of everything. Sometimes, this is just impossible. If there are 10 desserts, try a couple of them, but don't shoot for all. Pick your favorites and try a couple Day 1 and see if you can take some home for the next day or couple days. Try to make the serving sizes of each tasting small so you can enjoy each one without overdoing it. You don't need a huge slice of pumpkin pie to enjoy the flavor. Problem: Your family/friends/co-workers keep encouraging you to try their famous homemade <insert famous food item here>. You want to make all your family members (or friends/co-workers) happy, but you don't want to overeat. Solution: Especially if you're at a large family gathering, I doubt your family member will sit there and make sure they see you put their food on your plate. But, If they are or if they're insisting on serving you (and you think you have enough food on your plate for Round 1), tell them you'll be sure to get some on Round 2. You may never make it to Round 2, but you'll have at least distracted them and made them feel like you wanted to try it. Sometimes ignorance is bliss, no? If you have someone in particular whom you think will be upset if you don't eat their food, try to make sure it makes it to your (reasonably-portioned) Round 1 plate. Solution: After Round 1 of the Portion suggestion above, try to really listen to your body. If you feel full, don't go for Round 2 (seconds). There will typically be plenty of leftovers the next day anyways. If you're saving room for dessert, remember to do just that. Save room. You don't want to be full when dessert is being served and you definitely don't want dessert to put you over the top to an uncomfortable level of fullness. Solution: With all the holiday madness in full effect, you may not be taking as much care of yourself as normal, like making sure you're getting as much water as you typically need. Sometimes when you feel hungry, you're actually dehydrated. Make sure you're well-hydrated the day before and day of your big holiday feast to help prevent overeating and allow your body to know when it's truly full. Problem: You find it hard to eat healthy when all the appetizer, dinner, and dessert options are so not-healthy. Solution: You can't make a healthy meal out of french fries and milk shakes. Ok, so those probably won't be at your Thanksgiving meal, but you get the point. Luckily for you, it is quite normal (in most situations) to bring food (apps, sides, dessert, etc) to Thanksgiving. Take this opportunity to bring something healthy (or a couple healthy options) so if there are no healthy options, you can fall back on the food item you brought for support. Bonus - Bringing healthy food to the meal will encourage your family members (friends/co-workers) to eat healthy food, too. Problem: You use the holidays as an excuse to eat unhealthy food. Solution: In general, I don't think any foods are 100% off limits. In fact, for me, when I tell myself I can't have something, I only want it more. Unless you have a medical reason to avoid something, allow yourself to eat what you want. Buuuuut, to maintain your healthy lifestyle, try to eat more of the healthy items and less of the unhealthy ones. Fill your plate with salad and lean turkey but go light on the gravy, etc. If you need some more encouragement to eat healthy this Thanksgiving, why not give a dish a healthy makeover (even if you only sub out 1 ingredient) by playing my Thanksgiving Food Challenge? If you have any questions you'd like to get answered or answers you'd like to offer, please leave a comment. I'm sure others will find your feedback helpful. Thanksgiving Food Challenge - Who's In? Sometimes, I feel like the world is full of healthy eaters - especially when I'm browsing my favorite healthy living blogs, reading their tweets and surrounding myself with overall healthy pictures, recipes, and ideas. However, I wonder if we may actually be in the minority? I'm not up on the latest studies to know, but what I do know is that each of us can spread the healthy word out, like ripples in a pond. Rather than going on and on about this, I'm going to try to keep things simple. The idea is that we spread our healthy lifestyle with others this Thanksgiving season. At most Thanksgiving dinners (at least the ones I'm used to), whether you're hosting the whole meal or just bringing a side dish, you can bank on being able to share your mad cooking/baking skills with your friends, family, and even co-workers by cooking the main dish or bring something on the side or for dessert. The Thanksgiving Food Challenge is simple - choose a dish and make at least one small change to make it healthier. You can make as many changes as you want, but even one change is great. Leave a comment on this post with your email address and choose one of the following: 1. a comment explaining what you made and what you changed or 2. a comment with a link to your blog post/web site explaining your makeover. 3. a comment saying you tweeted your challenge entry (use hashtag #tdayfoodchallenge). I'll randomly select someone from the group who posts by the deadline to receive a handmade (by me) pair of Swarovski pearl drop earrings (sterling silver) - perfect for your next holiday party and just in time! I have a couple other pearl colors and several crystal colors and would be happy to help you pick some colors to match your preferences. I started off today in a bit of rush, trying to get some stuff pulled together for hubby while he slept in, so I rushed out of the house without food or coffee. It all worked out ok because I was able to smoothly pull off his breakfast in bed V-day treat, so the lack of caffeine was worth it. After delivering hubby's breakfast, I was ready to get some caffeine and food. I had a cup of the usual - FM Breakfast Blend with sugar and 2% milk. I also made myself one of those pomegranate juice mocktails, which was quite tasty. I also had 2 pieces of bacon and a donut. I really shouldn't have had the donut since I ate so much Thursday and had the pastry last night, but it's Valentine's...the weekend to indulge in all things sweet...at least that's what it is for me. :) Everything was quite tasty! ...and some Yogi Tea - Berry detox. Yogi quote of the day - "The power of love is infinite." How appropriate!? I was hoping to do a more rigorous workout, but totally ran out of time today. Normally, I would shrug off working out complete, but ended up doing a quick walk with hubby. We went for about 30 minutes with Bailey, who loved every minute. I liked the walk, too...it was quite energizing and a nice break from all my errands. I can't believe I let myself wait so long to eat something again. I really should have had a snack, but was so busy doing things that I totally forgot! I finally had some leftover veggie soup, which we defrosted from the freezer. And, I whipped up a quick veggie cream cheese using veggies from the fridge (red onion, carrots, and celery), which we spread on toasted GHBC bread. Yum! I love how hearty their breads are - especially since they grind their own wheat. I am going to have to work on not letting myself go for so long without any food, busy or no-busy! I did have a bite of a cupcake (sans frosting), which hubby was taste-testing for me, and one of the cut-out hearts smeared with frosting. For dinner, we had plans to head over to Kath and Matt's place for a Valentine-themed potluck party. Their place looked so cute with little hearts everywhere. There were plenty of good eats, including Amanda's mushroom risotto and Nate's assortment of Trade Joe's goodness. I kicked off the night with a pom-tini. It was so fruity and delicious...a great cocktail to start things off. I had the ski wine charm with cute turquoise-y beads. I nibbled here and there throughout the night and did my best to capture everything, though I I know I missed a few things. I had a few bites of veggies with various hummus-type dips. Then a couple pieces of toasted bread with Kath's Smoked Salmon dip and Nate's Spinach Artichoke dip. I love dips and these two were fab! Next, I moved on to Kath's salad, which featured mixed greens and all red/white ingredients - red pepper, strawberries, cranberries, and cheese. I drizzled my salad with some Annie's raspberry vinaigrette. The berries were so fresh and the salad combo was divine! Next, a cracker with some fab Vermont white cheddar and some mushroom risotto. I normally don't like mushrooms, but I do like some mushroom dishes, and this risotto was one of them. I should have gotten a little more of both of these! They were good! Then, it was on to pom-tini #2. Then, salad and veggies #2. I ate some of the veggies before taking the picture. I also sampled 2 kashi crackers (honey sesame and 7 grain), which I didn't photograph. And last but not least - dessert! I had a half piece of some white-chocolate cherry dessert bread (yum!) and one of my brownie cupcakes. We had a blast at the potluck! It was so nice spending the night with friends instead of bothering with the fuss of long waits, etc on one of the busiest restaurant nights of the year. I can't wait for the March potluck!! When we got back from the party, I couldn't resist having 2 more of those mini hearts smeared with more yummy frosting. I washed the sweets down with a tiny mug of milk - about 1/4 cup. After hubby's surprise earlier, I still had a lot of work to do today - it was cupcake time. I couldn't post this earlier because the cupcakes were for a potluck party (post next in line) and some of the guests and the hosts read the blog and I wanted the treats to be a surprise. It's pretty late here, so I may just do this post a series of pictures, since I still have 2 others I need to do. Melted chocolate. This is the base for the cupcakes and brownie square. Adorable cupcakes. I made these cupcakes using a recipe from Martha Stewart Living February. The sprinkles were my own little addition. Both hubby and I adore sprinkles! A closer look at the sprinkly, brownie heart goodness. Yum! The cupcakes actually came out a little dry, but the frosting was divine and the brownie hearts were pretty moist. The recipe made a ton of cupcakes - 24 to be exact. There were plenty of leftovers from the party, so I'm sure to have some happy co-workers on Monday. 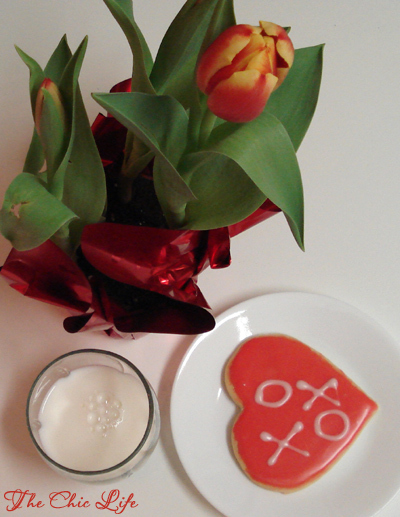 Reader Question: Did you make anything special Valentine's treats this weekend? I woke up extra early this morning to put together a special surprise for hubby for Valentine's Day, since he already took me out to celebrate. I snuck out of bed, moved a couple key items (tray, clothes to go out in, and magazine with recipe) to the living room area, and took the dog out. I was as quiet as possible, hoping hubby would continue to sleep in (like he usually does on the weekends). After taking the dog out, I changed clothes quickly and ran to the grocery store, a local hardware store (they have cute kitchen stuff), and a local bakery. I got the groceries I needed for breakfast, 2 new seersucker placemats (on sale for $3 each, plus I had a $5 off coupon!) from the hardware store, and 2 sweet treats from the bakery. By the time I got back, I was thankful to see hubby was still asleep, and I got started on breakfast. I took a cue from my February Martha Stewart Living magazine and decided to make the same egg, toast, and bacon breakfast I saw pictured in the mag for hubby. I used Texas Toast as the base bread for the meal. I went through a couple pieces trying to get the perfect heart shape for hubby's plate. I figured I could take one of the "messed up" ones. The cutting was the tricky part - the rest was a cinch. While the food cooked, I prepped his tray and made a breakfast drink based on this recipe from Ina using some of my weekly food challenge ingredient - pomegranate juice. I set the plate the same way Martha did, but I added one of those sweet treats I got from the bakery - a cinnamon pretzel twist donut. It's one of hubby's faves. I also added a Valentine's-themed paper napkin, a small pink flower, and his breakfast mocktail. Hubby looked so happy to see me waking him up with a tray full of goodies and his big goofy grin made my day. Heat a non-stick pan over medium heat. Use a heart-shaped cookie cutter to cut out a heart in the center of a piece of Texas Toast. In pan, melt 1 1/2 tsp butter. Add the outer piece of Texas Toast to the pan and cook till light brown on one side. Melt another 1 1/2 tsp of butter in pan and flip bread. Spray the cookie cutter with non-stick spray and fit into the heart-shaped hole of the bread in the pan. Pour 1 egg into the cookie cutter, cover pan, and cook for 2-3 minutes. Meanwhile, toast the heart-shaped center piece of the Texas Toast. When the egg is done cooking, remove cookie cutter with some tongs (don't touch, it's hot!) and serve bread/egg on a large plate. Sprinkle egg part with salt & pepper to taste. Add toasted heart-shaped bread to the plate to dip into the yolk. ...and I couldn't wait to dig into one of those Perfect 10 Western Bagels I got from my swap. These guys were really good - kinda soft, lightly toasted, and really "airy". They tasted great with about 1 tsp of butter - a great way to start the day! I couldn't wait to dig into one of the teas from the swap! This tea is soooo much better than the pomegranate green tea I have. A shame I can't buy this around here! The taste was fruity, light, and refreshing and brightened my morning at the office. For lunch, I heated up some of that leftover capellini pomodoro from the other night. It heated up really nicely (especially with some extra parm-regg on top for that yummy, salty bite). I only wish I had some more fresh basil to top this puppy off. I also had a slice of GHBC bread. I only wish we had a toaster in the office because it would have been so much better toasted with this lunch (IMO)! I also had some water with lunch and watched Food TV on HD on the break room TV - caught the last half of 30 Minute Meals and some of Barefoot Contessa. If I had just eaten a little later, I could have caught Healthy Appetite! Wow, this is one carb-alicious day so far! It's all good...I love my carbs! I also dug into the chocolate tea I got from my swap. I had no clue how this tea would taste, but it reminded me a lot of the Mate Vana I drink from Teavana....smooth and rich (rich for a tea of course). Very good! I started feeling snack-y after my tea, so I grabbed a quick handfull of some Tahitian Gold I had stashed away in my desk. The crunchy walnuts and sweet dried fruits really hit the spot. 8:30 pm - Early V-Day Dinner - Stuffed! Hubby took me out tonight for an early Valentine's Day dinner to a local restaurant Villa Antonio. I didn't even know he was planning all this till he called me earlier today to brainstorm where I wanted to go. We started the meal off with one of my favorite parts - the bread! In the silver dish was some olive oil and balsamic vinegar...yum! I had about 1 1/2 pieces over the night. Hubby asked if the waiters were featuring any wines and after they showed us 3 options, hubby picked the Red Rock bottle of merlot. Hubby decided to do the Restaurant Week special, which was over in January but extended in some locations. He got 3 courses for $30...a steal, no? For his first course, he got calamari. I had 2 pieces of his calamari - the sauces paired very well with it. I ordered off the menu and got a Caesar salad to start. They mixed it together table-side. My salad - sans anchovies - yum! The lettuce was crisp, the dressing was creamy, and the croutons (which I think were made from the same bread served with the oil/vinegar) were crunchy. Great salad! I'd like to say I had one glass of wine, but the waiters did that thing where they refill your glass throughout the night, so I'm not sure how many I had. I'm not a big drinker, and I drink slow, so I think I had about 1-2, but most likely 1 1/2. After the app and salad, they brought out some mango sorbet, which they drizzled with champagne. Mmm...great palette cleanser! The entrees came out covered in silver and the waiter uncovered both our dishes at the same time. I had the veal saltimbocca. Hubby had the rib-eye with a red wine sauce. Both came with potatoes and green beans and cherry tomatoes. As you can see, I rather enjoyed mine. But, the night wasn't over yet. No, far from it! Next, they brought out their dessert bar, which they rolled out on huge cart. You guys know dessert is my fave part of the meal! Hubby got the tiramisu, which wrapped up the third course of his meal. He, of course, let me have a couple bites. I had bananas foster - one of my fave desserts. The bananas were cooked in liquor and sugar, flambed, and served over ice cream with chocolate sauce in a pie-crust-like bowl. The candied syrup dripped over the "bowl", which only made it extra tasty. After the bananas were gone and the ice cream eaten or melted away, I broke off tiny bites from the edges of the bowl, and boy were they good! They were sweet and sticky, almost like peanut brittle (but without the peanutty taste). Given enough time, I think I could have eaten the whole thing, but even though I was already starting to feel overly full, I tried to stop myself from eating too-too much. Oh and see the thing sticking out of the bowl that looks like a treble clef (wow, I do remember something from all those piano lessons when I was a kid!) - that's edible, too! We had a great time at dinner. If anyone lives in the area, they should definitely check this place out. The food was delicious, the atmosphere was cozy, and the service was impeccable. This place would make a great restaurant for a romantic date or even business dinner (or lunch). We'll definitely be back! We got back from visiting hubby's mom and the rest of his family late-ish Sunday night. We stopped mid-way to grab Cracker Barrel for dinner, and I got my usual - Grilled Chicken Tenders with corn and macaroni and cheese and, of course, a biscuit with honey to add a sweet ending to the meal...yum! Hubby wanted to open Christmas presents later that night, so I had to unpack and then wrap all his gifts up and add them under the tree. I had planned to make a trip to Target for some stocking goodies, but hubby made me promise I wouldn't buy anything extra to try to make up for the camera. He also told me he didn't do a stocking for me, but do you see that red, fuzzy-looking thing just under our tree? Doesn't that look like a stocking to you? He had all his gifts hidden with my stocking and only took them out while I was busy in the other room, so I totally believed his story. Sneaky guy! I couldn't believe Mr. Chic had anything more for me to open for our fourth Christmas, since I opened my camera with his family, but he had a couple small gifts left for me - some pretty socks, white T's I asked for from Gap, and tickets to the circus, which should be fun. I haven't been in ages! I got hubby some stuff from Brooks Brothers, a sweater from Banana Republic, a graphic tee, and this adorable polka dot tie! I probably shouldn't call it "adorable", but I really do just love it and I think hubby will look rather dashing with it, too! After we finished opening our presents, we had some time to unpack a few goodies from our Christmas stash. My new ornament (that I mentioned yesterday) from hubby's mom fit perfectly with our tree's color scheme. I swear the pink in the angel's dress matches those little pink balls to a 'T'! My MIL got it from a cute boutique that features handmade goodies from women. Someone actually handpainted this ornament - isn't it the cutest? And, here are those vintage-y goodies (I mentioned yesterday) that hubby's sis searched out for me for my Christmas present. The left two pieces go together - a turquoise bowl with a daisy-like top. The right piece looks like some sort of ceramic pot. Aren't they pretty? They will go nicely with my vintage/thrift collection. Anywho, I had another post or two I could do tonight, but I'm truly exhausted. I got to work at 8am (relatively early for me), took a quick break to catch up with a friend whilst walking for bagels, had lots of meetings, had lunch with a co-worker from last year's project, and started transitioning my knowledge from the recon project I'm working on to the dude who's going to take over my work when I leave. My new last day on this project is the 31st (tomorrow). I also stayed late to create some documentation for this guy to refer to since I won't be there to answer his questions after tomorrow. There are a couple people on the project who can answer any questions he may have, but these people barely have time to eat, let alone answer lots of questions. Anywho, I left work at 6:15pm, cooked dinner, cleaned around the house, worked on this blog post, and now I'm going to finish my cozy, bedtime tea and hit the sack. Phew! G'night! We left on Christmas Eve to visit Mr. Chic's family for the Christmas weekend. We arrived at hubby's mom's house around 7PM, and while hubby decorated the tree with his mom and brother on Christmas Eve night, I wrapped up the rest of my presents for the next day. Bailey hung out in his Santa costume most of the night. We got him a large Santa costume, but I think doggie clothes are just not made for a corgi's long and thick body shape. We couldn't get the velcro closed on this costume. Perhaps I'll try to make him one for next year. Could be a fun project, no? On Christmas morning, we spent our second Christmas opening presents with hubby's mom and brother. Mr. Chic's mom loves to shop, so she had a plethora of goodies for us to open Christmas morning. Dan got (practically) a whole new wardrobe and lots of other great gifts. Among many other fabulous things, I got Giada's new cookbook (yay!) - Giada's Kitchen, a pretty new ornament, one of those digital picture frames (it holds up to 2,000 photos...wow! ), some gourmet socks, and some fun (pastel turquoise - my fave color!) stationery. After all the present-fun, we took Bailey for a quick walk around the block. Here's a shot of the Bails running. He always looks so happy and playful when he runs...especially when his tongue hangs out of the side of his mouth like it is in this photo. After settling back into the house and relaxing for a bit, Mr. Chic and I went to town preparing those pecan bars for Christmas Dinner at Uncle D's and Aunt S's house. Dinner was amazing, as always, and the table was uber-festive in a rich, Christmas tree green. I had a glass of white wine and a great seat next to hubby's mom's famous "dry dressing." I also enjoyed a wonderful meal of turkey, gravy, dry dressing, salad, and mashed potatoes, but I was so hungry, I ate everything before I thought to take a picture. Oopsie! We had a blast opening presents. I was most looking forward to seeing how everyone liked the presents I worked so hard making and purchased for them, but hubby threw me for a loop by sneaking my new camera into the group of gifts. I didn't even see it coming, but I opened the zoom lens box first. The box didn't say zoom lens, it just looked like some sort of strange electronic box, so I figured someone had used a box from something else to wrap something totally different inside. Seeing my confusion, hubby stopped me halfway from opening the rest of the lens and directed me to open the larger box, which I was shocked to see was the camera I was hoping to open when we got home. I got it early!! We said we'd open presents when we got home, but Mr. Chic wanted me to open the camera on this night since some of my "new" fam helped make this camera possible for me. Besides the camera, I got a cute snowman statue, two (count 'em...TWO) Barefoot Contessa cookbooks (yippee!) - Barefoot Contessa - Back to Basics and The Barefoot Contessa Cookbook, and some cute vintage-style stationery. The day after Christmas was spent playing with my new camera and doing a little shopping with Mr. Chic. The next day, we grabbed a quick Dim Sum brunch, and I talked hubby into stopping by the yarn shop, Yarns Etc., so I could get my yarn fix. I got two new balls of yarn, which I forgot to photograph, but I can tell you they are super yummy! We also stopped by the Whole Foods Market, which was next door to the yarn shop. I was just going to pick up an apple to snack on, but was stopped in my tracks by the fresh fruit juice stand at the front door. Whole Foods had one of those juicer machines that squeezes all the juice from fresh veggies and fruits. After having a small sample of each of the four pre-made juices, I opted for the Strawberry Orange flavor. Yummy! Hubby's sis and her fam came into town later that night, and the kids got to open a sack of presents from Santa. The next day, I woke up early and took Bailey for another walk around the block. I usually like to try to sleep in as much as possible when I'm on vacation, but I have to say the warmer-than-normal morning was a welcome surprise, and the fresh air left me feeling invigorated for the day. Once everyone was awake, we celebrated our third Christmas by opening presents with hubby's sister and her family. Nephew A got the Wall-E toy he's been asking for for the last year and a light saber (in the background), which he played with the remainder of the weekend along with the other toys he received. ...and some pretty pink wings! She got lots of other stuff, but if I tried to name everything everyone got, I could go on forever. We have some serious shoppers in our families! Hubby and I got a set of cordless phones, which we really needed, from his sis A and her hubby M. His sister also made a trip to her town's new consignment shop in search of turquoise goodies. She found two amazing finds, which I photographed tonight and will post later this week. I didn't think any one would actually go thrifting for me, but A did, and I'm so thankful for her thoughtful gesture. We spent the weekend before Christmas celebrating the holiday with my family. As usual, we spent lots of time eating, relaxing, and catching up. Even though we had a short weekend to spend with the fam, Sis and I had time to spent a fabulous afternoon meeting my bloggy friend, April, the events of which I posted about last weekend (click). After our yarn-fun, we had Christmas dinner with the fam. Mom had the cool idea to hang ornaments from our chandelier. I was pretty proud of her because she isn't nearly as crafty as Sis and I, and I thought the idea was rather ingenious of her. I also liked the table set-up she did - a red holly table cloth, a green holly placemat, a red napkin, and silver napkin ring holders, I had a Christmas tree-shaped holder, but hubby had something else...I think a reindeer or something. Sis made her traditional mashed potato pool, which she carefully constructed with her fork to ensure no gravy spilled onto her plate. I poured gravy all over my potatoes and turkey, but you may notice I corralled all the gravy to one corner. I like gravy, but not touching my veggies. For dessert, we had some pound cake my parent's neighbor gave them for Christmas. The pound cake was pretty darn tasty. We enjoyed a few pieces, each, over the weekend. After dinner, Bailey waited patiently for the ok to get his bite of Christmas dinner. We are trying to not feed him too much human food, so you can see the tiny scrap of turkey he got in the photo. Regardless, he was quite happy to get that little taste. Bailey was even more pleased to see Santa-Sissy. She and I stopped by Petsmart on our way home from our Bloggy fun to pick up a treat for Mr. Bails. The Christmas goodies were already way on sale, so we picked up a couple. Bailey loved the Candy Cane shaped treat! After dinner, I got started on some of my knit WIPs, but was happy to help out my sister who asked me to teach her how to knit. See her garter stitch in the works? I think she's going to try to make a scarf. Go sis! For lunch the next day, Dad made a nice, healthy soup with the leftover turkey and some fresh veggies. We opened presents when Sissy got home from work. Even Bails got to join in on the festivities as he munched on his candy cane treat. Can you believe he ate the hook off that thing so fast? Bailey eats treats twice as fast as dogs twice his size. It's pretty funny to see, actually. I got lots of goodies, but especially loved the Bath & Body Works antibacterial soap (love thist stuff! ), a CD my sister made of her practicing the song she sang at our wedding (When You Say Nothing at All), and my first Debbie Bliss book - Baby Knits for Beginners. I realized as soon as I opened my new book that my parents may think I was trying to tell them something by the title of the book. Luckily, they didn't say anything...phew! I just figured baby knits would be easier to make than a full-blown Debbie Bliss sweater. Those look so complicated, though I do want to try those knee-high socks from the DB magazine. Christmas with my fam went by too soon and I was back to work by Monday. Hopefully, we can spend more time with them next year! It's Here! It's Here! It's Here! My DSLR is Here! As you can probably tell from my post title, I am extremely excited to share that my Christmas wish came true! I got the very nice, very wonderful, very fantastic DSLR camera that I have sooooo longed for. And, not just any DSLR, but the Canon Digital Rebel XS, which is the model that my year or so of research has said is the best of the best. Sure, you can get something "top-of-the-line" (note quotes) for, say, a thous more, but for me, this camera is as good as it gets and exactly what I wanted. I have wanted one of these Rebels for what seems like forever now, but since I've been paying off my credit card, I haven't been able to afford it. Thank goodness Santa can! I am still working out the kinks and trying to figure out how to use this camera to the best of its ability, but I'm thinking that knowledge will come with lots of practice, patience, and positive energy. Till I become a DSLR expert, I will have more fun that I probably should be having by practicing with my camera. We just got back from out-of-town and from the 26th till today, I have already taken a whopping 320 photos. Can you believe that? The difference in the quality of photos is amazing, though. I love how the "nice" cameras do such a good job at focusing on the foreground while blurring the background just a bit. And, I also love how this camera can make the simplest things look so out-of-this world. Here's a photo of one of the Pecan Bars I made for Christmas Dinner. More on this later, but for now, you can enjoy the sneak peek. Now, how may all of this be possible, you may wonder? Sweet Hubby contacted everyone in the family to see if anyone wanted to help him out with getting this for me for Christmas, and would you know it...some of my new fam decided to help Mr. Chic out with this request. Thanks everyone - you don't know how great this present really is and how much I will treasure it! Since we just live in a tiny apartment, our decor is pretty minimal for the moment, but this will be our third-ish (I think we've gotten three trees so far...or was it four?) Christmas tree. Last year, I picked up a ton of Martha Stewart Christmas decorations from K-Mart and also made a bunch of ornaments. I made some sparkly snow(wo)men, some glittered spheres, some jazzed up embroidery hoops, and some simple snowflake circles ornaments. For this year's Christmas tree, I used all the same ornaments from last year and even added some sparkly turquoise garland that I actually bought last year, but just now put up. I'm going for the traditional Christmas colors with a twist by pairing the classic red, green, and white with pink and turquoise. I wish I had some more pink and red ornaments to put on the tree, though. I ran out of crafting time this year, but hopefully, I'll have time to make more next year. Here's one of my snow(wo)men ornaments with some of those pretty Martha Stewart ornaments. You can see the tips of some of my other handmade ornaments in the edges of the photos. And here you can see our new ornament addition - a glittered starfish, which we purchased at The Atlantis on our honeymoon in the Bahamas. Isn't she gorge? Oh, and I almost forgot to add this photo looking down the tree so you can see the tree skirt. This is another purchase from last year's Christmas decor spree from Martha's K-Mart line. I wanted to make a tree skirt, but I'm glad I got this one for now. 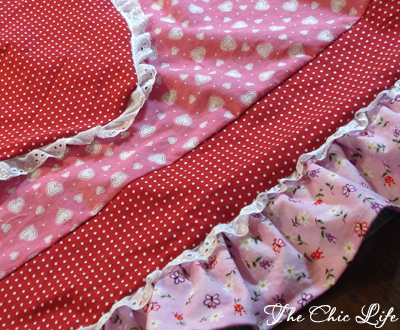 The tree skirt is super cute in red, white, pink, and green with adorable holly berries and a scalloped-looking edge. What colors are you doing for your Christmas decor this year? So, I've been to three parties this holiday season where the game of the night was "Dirty Santa." The first one was at an Ugly Christmas Sweater Party with friends. I was the DD, so I drank Coke all night, but everyone else was so toasty by the time we got to the game, no one was paying attention to the rules or really interested in playing, so we just each took a gift from the pile and kept whatever we got. The second party was my company's holiday party - we always play this game and the game always gets interesting, since the group is so tight-knit and people bring funny gifts like last year's "Kevin Federline Kit", which came with his then-new CD and a white, men's tank top. I usually just bring gift-cards since that's what I'd want, but next year, I want to do something good and funny. The third party was the one I went to tonight at the office. Out of all three parties, I've lucked out this year as far as gifts go. Usually, the good gifts get stolen away from me (Murphy's Law), but so far, I've racked up a Chick-Fil-A gift card, lottery scratch-off tickets (we won $52! ), and a Starbucks gift card. Not too shabby, eh? Tonight, I got extra lucky with my number selection: 35 (out of 37, I think). For those of you who haven't played "Dirty Santa" (click the link for more info and rules), the higher the number, the better off you are. My 35 got me that adorable sachet pictured above and inside...my Starbucks gift card! I'm super excited about using that gift card because I've been working really hard on giving up Starbucks, and I think I'm ready for a reward. I used to drink Starbucks two or three times a week and wondered where all my money went. After calculating and tracking my expenses, I realized a shocking amount was going to my latte habit (the rest to clothes), so I weaned off (both). I hardly ever get S-bucks (or clothes) any more, but I'm ready to enjoy some lattes soon, thanks to my gift card...yippee! Have you played any Dirty Santa games this year? Did you get anything good? So, I'm behind a few posts, but I'll probably just do a bunch over the next day or two to catch up. I also have some posts from a few weeks (or months) ago I need to work on, and I'm hoping to get those up soon, too. We pulled up to my parents' house last Thursday close to 1PM, and I was fully prepared to spend the rest of the day in the kitchen with my sister. See, my mom is a nurse and works every other Thanksgiving (same deal with Christmas), so she was working on Thanksgiving till around 4PM. Sissy and I planned to cook our Thanksgiving meal, however, when I got to my parents' house, I was informed that the turkey had been prepared by mom that morning, put in the oven by sis at 12:15PM, and that a couple other dishes had already been pre-pared. Oh, and sis had already baked two pumpkin pies and peeled the potatoes - sweet and yukon gold. We did find a nice sweet potato casserole recipe online, which we decided to try out, click here for recipe, and I actually got to help make it this time. I especially liked the recipe because it didn't contain cinnamon, which I'm slightly allergic to. I can eat cinnamon, but I only go for it when I really, really want something with it...like those cinnamon rolls at the mall...mmm...haven't had one of those in awhile, actually, now that I think about it. Anywho, this was the BEST sweet potato casserole I've ever had. It's definitely worth trying, if you're interested. Mom came home in time to get cozy in some PJs and help wrap up dinner. ...and this was our first year trying out the ole Green Bean Casserole. I have to say...I was quite impressed with the taste of the casserole. No wonder people make this every year...it's delicious! The French onions on top really make the dish. We used the recipe on the back of the French Onion can, in case you need a recipe. *Update - Just found the recipe online at Frenchs.com (click here) if you want it now. * For some reason, we had diced red onion in our casserole...not sure if the can had a different recipe than the online one or if mom just added those in for fun. They tasted good either way. We, also, had some delicious challah bread, thanks to my friend June who baked me a loaf. We also had a couple slices of rye bread my sis brought back from Panera...even though I told mom we didn't need any bread since I was bringing the challah with me. I guess it's good to have options, though. Even Bails got in on the action. We snuck a wee-little piece of turkey in his dog food. He waited very patiently for Mr. Chic to give him the "ok" to eat it. As seems to be the trend, we ate way too much food, but enjoyed every bite. I'd like to say we saved room for dessert, but we didn't. I had a slice of pumpkin pie a couple hours after dinner when I was able to fully enjoy it. It was the perfectly sweet ending to another amazing Thanksgiving. What did you eat for Turkey Day? I came home to a sweet little pre-V-day surprise earlier this week. I think it's so funny how the cookie and the flowers match. If you knew my SO, you'd know he hasn't the slightest bit of artist in him, so it's just a strange coincidence how they coordinate. But, artist or not, I love him! :) I love him for these little surprises that he hasn't done as much since starting night classes for his MBA but still tries to squeeze in now and again. I love how he knows how much I adore this little, local bakery down the road and has started trying to get me little treats from there now and again b/c the place seems to only be open when I'm at work and can't make a trip there myself. This is the same bakery that makes those fabulous donuts...mmm. Don't you just love those locally-owned places around your town? It's great to be able to support a small business, but beyond that, the goods from these cute places always seem more special, much like how something thing that is handmade can be so...heartfelt. Do you have a place like this in your hometown? Maybe you've driven by it before but never stopped? It's funny how these places can be such "holes-in-the-walls" sometimes - places you'd drive past and never notice. Anywho, I encourage you to check out your local offerings - the locally owned bakeries I've been to have always been the best...and you guys know I know my sweets! I've had an idea for a cute Valentine's Day craft project for awhile, but I haven't had the time to breath life into my design...not until yesterday after work. I actually started a few days ago by sketching out a couple ideas. 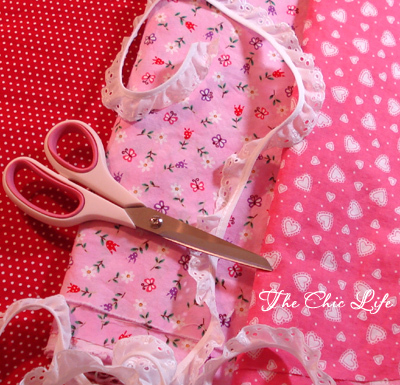 I thought about making some totes or random sewn goodies, but the aprons won out. 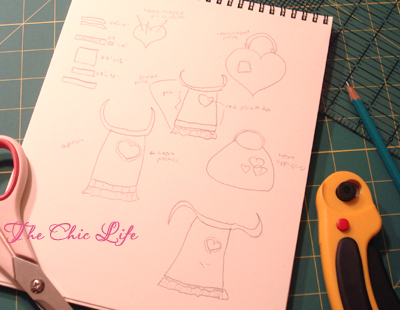 I really wanted to do an apron with a cute, heart-shaped pocket. I've been working really hard on developing my fabric stash (read I can't stop buying cute fabric), so after choosing my sketch, I had to pick out my colors and fabrics from my ever-growing stash, which was pretty easy. So, yesterday, there was some cutting and piecing and sewing. 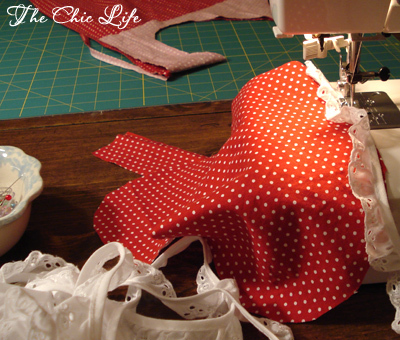 I actually had most of the apron put together yesterday, but sleepiness made me wait until tonight to finish. I almost didn't do the ruffly edge on the bottom because it seemed kinda complicated, but it turned out ok.
Ta-da! Wow - that heart pocket turned out way bigger than I thought it would! Oh well, it's still cute. 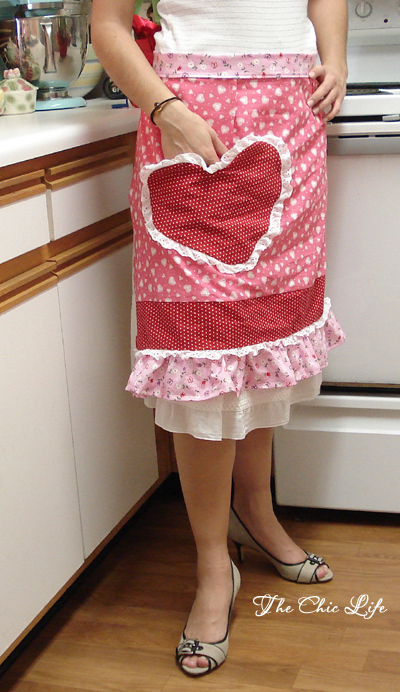 Now I have something Valentines-y to wear to do some Valentines baking!